With the news that the gunman in last week's school shooting in Parkland, FL used an AR-15 to slay 17 people, gun control activists are renewing calls to ban the firearm. It's not only liberal lawmakers making the suggestion, however. In an interview with CNN, Gov. John Kasich (R-OH) openly wondered why Americans need access to AR-15s. "If all of a sudden you couldn't buy an AR-15, what would you lose?" Kasich said he asked his gun collecting friend. "Would you feel your Second Amendment rights would be eroded because you couldn't buy a God darn AR-15?" 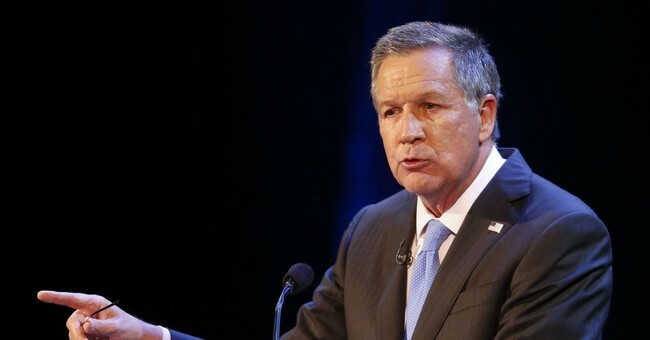 Some AR-15 owners explained to Kasich why they bought the firearm. I choose an AR, because I like the platform. It's easy to aim, and has a very manageable kick. I use it for target shooting. I have friends who use theirs for shooting wild boar (we're over run with them in Texas). Still, the governor suggested a ban is the way to go. "Common sense gun laws make sense," he said. In conjunction with his remarks, his campaign website reportedly softened its language on the Second Amendment. CNN made note of the alteration. The February 17 version of the campaign page, entitled "Defending the Second Amendment," includes images of Kasich at what appears to be an ammunition store and touts an endorsement by the National Rifle Association in his 2014 re-election campaign. The campaign suggests "removing burdensome restrictions for law-abiding concealed carry licenses" and highlights "opposing Barack Obama's gun control efforts." But a current version of the page, renamed "Common sense on the Second Amendment," does not include images with gun owners or advocates. The page states that Kasich "recognizes the need for common-sense solutions to our nation's problems." The Marjory Stoneman Douglas High School survivors are marching to the Florida state capital Tuesday to demand gun control legislation. A similar protest took place in front of the White House this weekend.